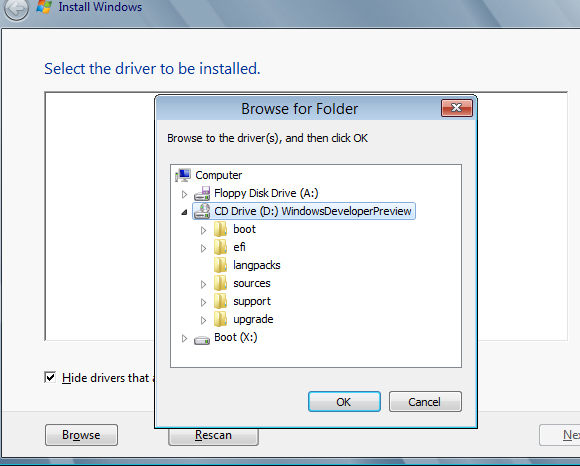 Windows 8 Installation ERROR: "A required CD/DVD drive device driver is missing. 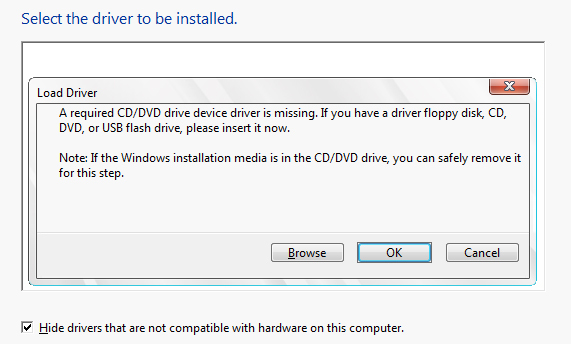 If you have driver floppy disk, CD, DVD, or USB flash drive please insert it now". I was much excited to see the new Windows 8 Developer Preview installed in my system. I just downloaded Windows 8 64 bit version in ISO format, and VMWare Workstation 8 evaluation as well. Created new virtual machine with all the required component configurations, and mapped ISO image as first boot device. Initial few steps were loaded smoothly until 'Install Now' option. Once clicked next button, I could see few error messages, as mentioned above, related to 'device driver'. if anyone already worked around this issue, and completed installation please let me know the solution. I think burning the image into a DVD could resolve the issue, but prior to that we have to confirm that whether the ISO image is corrupted. Nobody has yet posted any work around for this until now, so just tired Googling. Here are few screenshots of the error. 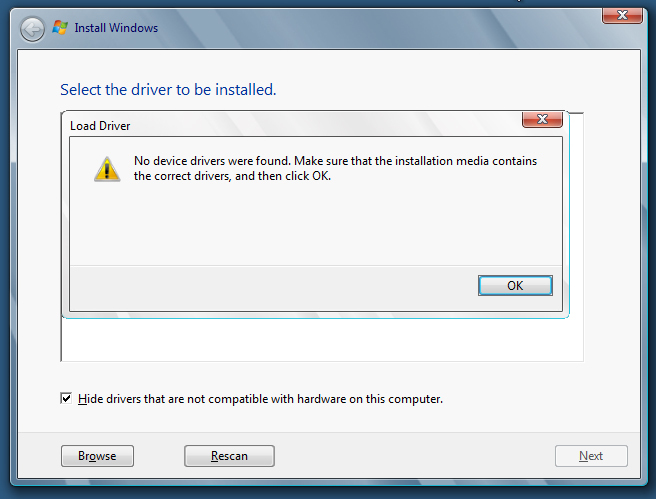 The first error message which shows installation media device driver is missing. Tried to select the boot device (ISO image which is mapped to VMWare) but no luck. Rescan doesn't help here. Throwing error message, No device drivers were found. Make sure installation media contains correct drivers. Here are few recommendations to fix this issue. Try below steps and share your feedback. 1. Check the size of the ISO file you have downloaded. It should be 3.6 GB for x64 version and 2.8 GB for x86 version. If your ISO file size is less than that, you can assume that your download is incomplete or ISO is corrupted. Please try to download again. 2. Try to use physical DVD instead of ISO file. Try to burn the ISO file to a DVD, and if the ISO file is corrupted, burning will be interrupted. How to Shutdown or Restart a Windows 8 Computer?